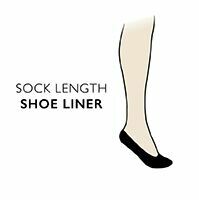 Stylish, despite being designed to be worn beneath the edge of most footwear, these men’s Falke Even Stripe Cotton Invisible Socks are more high cut than some ‘invisible’ socks, making them more suitable to business shoes or laced footwear. These cotton rich fine gauge socks are woven with an irregular slight slub similar to shantung silk, the colour in the stripe bands has a variation that mutes the shade in a faded manner. A diamond pattern silicone anti-slip panel in the back heels are placed to keep the socks from twisting or riding underfoot throughout the day.